Yet Another Mommy Blog: The New House! After 2 years of searching we finally found a new house! The last time we moved I painted every single room, and left the kitchen for last- it's still not done. 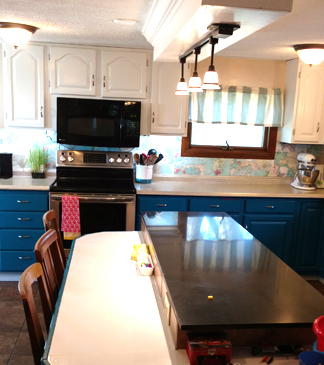 This time around I tackled the kitchen first. The kitchen was the entire reason I bought the house...that wall of pantry space is kind of a necessity if you live 30 minutes from the nearest Wegman's. 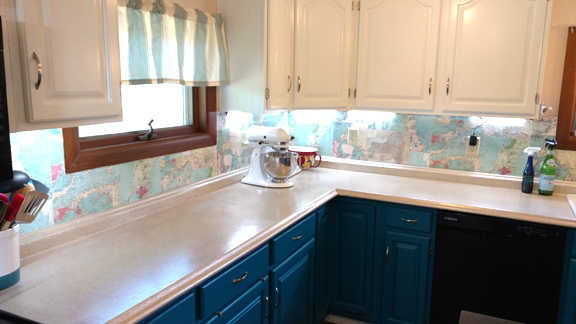 It has miles of countertops, tons of storage, and a really sweet backstory. The previous owner was a carpenter who did a complete remodel in a weekend to surprise his wife when she went away for the weekend. I loved it, but it was SOOOO dark. The day after closing we popped the cabinet doors off, and I started to paint. The uppers are semi-gloss white, and the lowers are teal (the name escapes me- it's all from Benjamin Moore). A tinted primer for the base cabinets made the job go a lot faster, and 2 coats of white Killz primer made it much easier to get them white white. 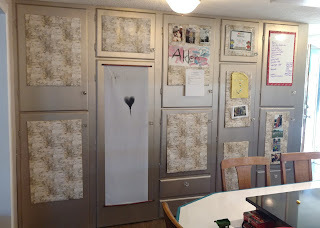 The pantry wall is a quart of Rustoleum Metallic paint in Champage- that stuff is tough to apply, it showed every single brush stroke, but I finally got a good finish with a flocked foam roller. It looked really empty when I was done so I made bulletin boards out of foam core covered in wrapping paper, and stuck them on with Velcro Command adhesive strips. 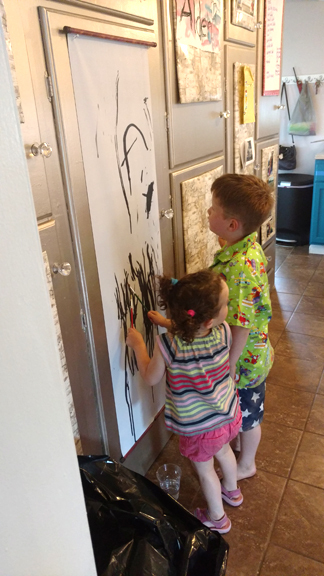 The large piece of white is "water writing paper" that I ordered from Hong Kong via eBay- if you have kids you really need a piece of this stuff. Ali got a chunk of it in a Koala Crate, loved it, and we finally found some more on eBay. I've never seen it in a store. You paint on it with water, and it turns black, and then it dries back to white in about 10 minutes. Every kid that's been in my kitchen has loved it, and it was $4.09 shipped. Get a few scrolls- they make cool presents! That was a beast of a project- the painting part is pretty quick, but sanding the stone smooth was a serious challenge. 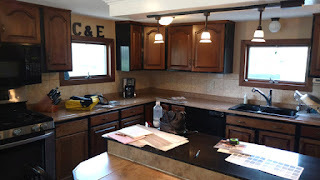 We used a palm sander, and I thought my arm was going to fall off by the time we were done. I added some mineral glitter to the top coat because it's kind of my thing, and I really wanted something to reflect light. I *love* the glitter. With all of that we couldn't leave the back splash untouched. 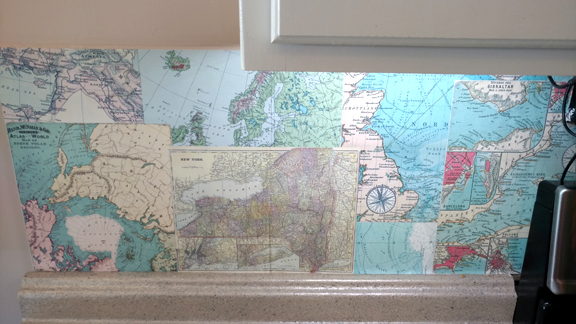 I used caulk to fill in the grout lines, and then applied some repositionable vinyl wallpaper that was custom printed by Dataflow. The maps are clip art from Etsy, and each map has a significance to us- places we've been, places our ancestors are from, and where we live now. The self-adhesive vinyl wall paper is a dream to work with- it covered up all of the bumps, applied easily, and it's super duper scrubbable. As I was making the whiteboard for pantry wall I popped a piece of whiteboard contact paper down on the island bar, and decided to cover the entire breakfast bar with it. 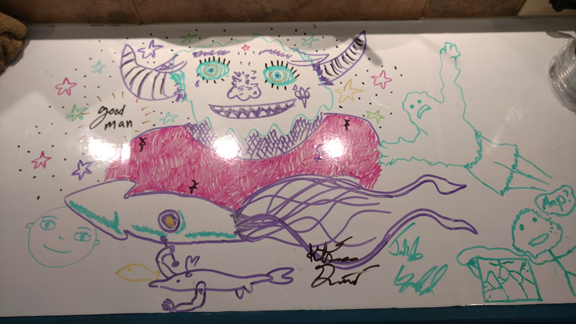 It's pretty much my favorite thing ever- Ali and I draw on it every day. We practice writing, numbers, write notes to each other, draw tons and tons of cars, monster trucks, and tractors, and everyone who visits adds something to it. 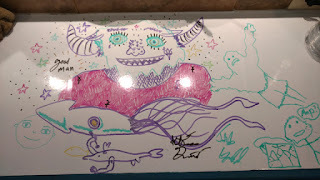 I take a picture of the artwork, and then erase it every night. It's become my guest book, my diary, and a way to connect people with the space. 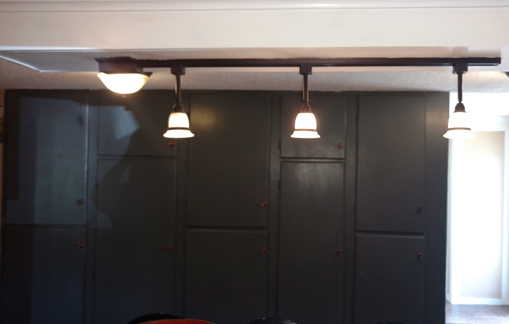 I also added some motion-activated under counter lights from Amazon that make is so much brighter, and it's great task lighting. We've never really done a lot of DIY projects- so I kind of can't believe we pulled it off. It was a lot of work, but we had a lot of fun doing it.